Huh-What Ruddy Cheek!! !We Want Our Country AND Our Waters Back !!! SCOTLAND’S fisherman have said they will not bow to pressure from the European Union (EU) to allow them to be held to ransom over Brexit. And they are calling for Theresa May to make an immediate impact assessment on current fish stocks in United Kingdom waters. The European Parliament Committee on Fisheries (PECH) is demanding access under its common fisheries policy for the right for fishermen from other countries to access up to 60 per cent of Britain’s fish supplies. And Brussels bosses say they will not allow Britain to sell fish to the EU should they not get their way. 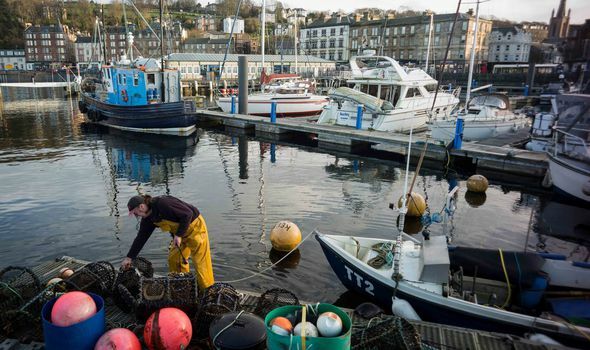 The concerning rhetoric has been blasted by fishermen in Scotland who are wholly opposed to the EU over the effect the bloc’s policies are having on their livelihoods. The industry is hitting back and today issued a direct demand to the UK and Scottish governments not to give away their income. The PECH Committee’s draft resolution under Article 50 negotiations demands the rights of European fishermen to access British waters. The report stresses: “The issue of free access to waters and ports is inseparable from the issue of free access of fisheries products to the European market. But the outrageous demands have infuriated the Scottish Fishermen’s Federation. Bertie Armstrong, chief executive of the Scottish Fishermen’s Federation, said: “The fish in our waters are our natural resource, and the industry, Scottish Government and UK Government will not allow them to be bargained away. “This is like asking the vineyards of France, Spain and Italy to give away 60 per cent of their grape harvest, free, to anyone who wants to come and take it away to make wine. “As a Coastal State, we intend to restore control of our natural seafood resource and under international law foreign-flagged vessels will be prohibited from fishing in our waters without our approval. “Negotiations on access that would prove beneficial to this country can take place after Brexit, when the new management regime is in place. Do not give up those waters. If the EU wants 60% of Britain’s waters, then Quid Pro Quo, Britain wants 60% of all EU waters.